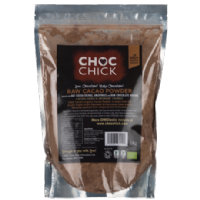 Choc Chick Raw Organic Cacao Powder is made from the prized single origin Nacional Arriba cacao bean and is ethically sourced from co-operatives in Ecuador. It is 100% cacao, minimally processed and with no additives or sugars. 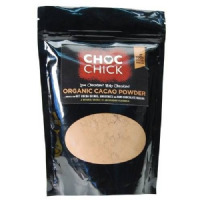 This natural cacoa is ideal for hot chocolate drinks, smoothies, sprinked on porridge and raw chocolate making. Easy to use 1g cocoa bean shapes of organic raw cacao butter. Organic Cacao Powder produced from the Nacional Arriba cacao bean and ethically sourced in Ecuador.